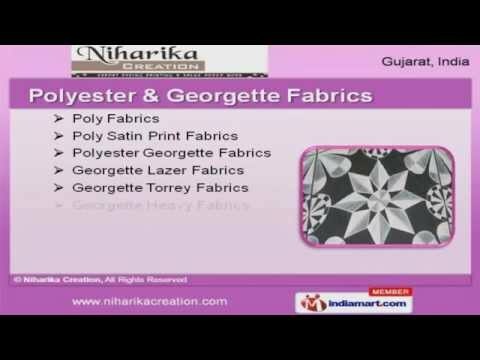 Welcome to Niharika Creation Manufacturer & Exporter of Polyester & FabricsThe company was established in the year 1997, at Surat. Our Spacious manufacturingunit & Experienced R&D department help us to cater Europe & America. Next and H & M are some of our esteemed clients and we are supported by highlycomfort & economical prices. We offer a splendid range of Viscose, Polyester Dyed & Knitted Fabrics. Our Polyester & Georgette Fabrics are extremely reliable. Chiffon & Crape Fabrics offered by us are appreciated amongst our clients for superiorquality. Our Polyester Cotton Fabrics are in huge demand across the global markets. We also provide Polyester Dyed & Knitted Fabrics that are available at industry leadingprices. Along with that we offer Viscose Fabrics that are nothing but the best solution for allyour needs.